Old Bollywood poster for sale of the vintage Hindi film Chandidas (1934). 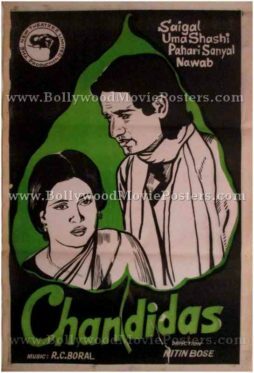 This is an actual surviving old Bollywood poster for sale of the 1934 Hindi film Chandidas that was produced by New Theatres, Calcutta and directed by Nitin Bose. Noted singer and actor K. L. Saigal who is regarded as the first superstar of Indian cinema played the title role of Chandidas in the film. Chandidas was the first successful film produced by New Theatres Calcutta. A remake of a 1932 Bengali film by the same name (directed by Debaki Bose), Chandidas carried a strong social theme involving the caste divide in India. The story of the film revolved around the life of 15th century poet-saint Chandidas who took a stand against social evils prevailing at the time such as the unfair caste system in India – in particular the practice of untouchability. The use of a full-fledged orchestra in sound recording was attempted successfully for the first time in Indian cinema in the film Chandidas, making this old Bollywood poster for sale highly collectible! Printed and circulated during the initial release run of the film (somewhere in the late 1930s), this old Bollywood poster for sale was printed for publicity of the film but never ended up being used. This old Bollywood poster for sale was originally designed in hand painted oil on canvas format by an art studio in Kolkata. The poster features quirky line drawn monochrome pencil portraits of the lead couple K. L. Saigal and Uma Shashi encased in a betel leaf. As was the norm with old Bollywood posters of the era, this poster has been designed and printed using only two colors (understandably to save on design and print costs). Songs from Chandidas sung by K. L. Saigal such as “Prem Nagar Mein Banaungi Ghar Main” and “Tarpat Beete Din Rain” became blockbuster hits and catapulted Saigal to nationwide fame. 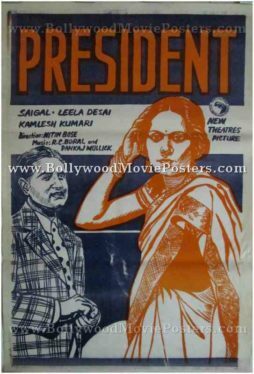 Vintage Indian poster for sale of the old Hindi film President (1937). This is an actual surviving old Indian movie poster for sale of the 1937 Hindi film President that was produced by New Theatres, Calcutta and directed by Nitin Bose. President starred noted singer and actor K. L. Saigal who is regarded as the first superstar of Indian cinema. Among all of K. L. Saigal’s memorable films which include cult hits like Devdas, President is often cited as his finest, making this vintage Indian poster for sale highly collectible! President is fondly remembered for an epic song sung by K. L. Saigal, “Ek Bangla Bane Nyara”. Written by Kidar Sharma, the song became a rare throughout the nation and epitomizes a common man’s dream of owning a home in India till date. Printed and circulated during the initial release run of the film (somewhere in the late 1930s), this vintage Indian poster for sale was printed for publicity of the film but never ended up being used. This vintage Bollywood poster was originally designed in hand painted oil on canvas format by an art studio in Kolkata. The poster features quirky line drawn portraits of the lead couple K. L. Saigal and Leela Desai. As was the norm with old Indian posters of the era, this poster has been designed and printed using only two colors (understandably to save on design and print costs). President was a Hindi remake of the Bengali film Didi. A social romantic drama from New Theatres, its screenplay direction and cinematography were done by Nitin Bose. President was the first Indian film to show a liberated educated woman running her own factory.